This article is about "scapegoat" in its religious and ritualistic sense. For the social-psychological sense of a person or group singled out for blame, see Scapegoating. For other uses, see Scapegoat (disambiguation). In the Bible, a scapegoat is an animal that is ritually burdened with the sins of others, and then driven away. The concept first appears in Leviticus, in which a goat is designated to be cast into the desert to carry away the sins of the community. Practices with some similarities to the scapegoat ritual also appear in ancient Greece and Ebla. The word 'scapegoat' is an English translation of the Hebrew ‘ăzāzêl (Hebrew: עזאזל), which occurs in Leviticus 16:8. The Brown–Driver–Briggs Hebrew Lexicon gives la-azazel (Hebrew: לעזאזל) as a reduplicative intensive of the stem ‘-Z-L "remove," hence la-‘ăzāzêl, "for entire removal." This reading is supported by the Greek Old Testament translation as "the sender away (of sins)." The lexicographer Gesenius takes azazel to mean "averter," which he theorized was the name of a deity, to be appeased with the sacrifice of the goat. Early English Christian Bible versions follow the translation of the Septuagint and Latin Vulgate which interpret azazel as "the goat that departs" (Greek tragos apopompaios, "goat sent out", Latin caper emissarius, "emissary goat"). William Tyndale rendered the Latin as "(e)scape goat" in his 1530 Bible. This translation was followed by following versions up to the King James Version of the Bible in 1611: "And Aaron shall cast lots upon the two goats; one lot for the Lord, and the other lot for the scapegoat." Several modern versions however either follow the reading as a demon, Azazel, or footnote "for Azazel." as an alternative reading. The scapegoat was a goat that was designated (Hebrew לַעֲזָאזֵֽל ) la-'aza'zeyl; "for absolute removal" (for symbolic removal of the people's sins with the literal removal of the goat), and outcast in the desert as part of the ceremonies of the Day of Atonement, that began during the Exodus with the original Tabernacle and continued through the times of the temples in Jerusalem. Once a year, on Yom Kippur, the Cohen Gadol sacrificed a bull as a sin offering to atone for sins he may have committed unintentionally throughout the year. Subsequently he took two goats and presented them at the door of the tabernacle. Two goats were chosen by lot: one to be "for YHWH," which was offered as a blood sacrifice, and the other to be the scapegoat to be sent away into the wilderness. The blood of the slain goat was taken into the Holy of Holies behind the sacred veil and sprinkled on the mercy seat, the lid of the ark of the covenant. Later in the ceremonies of the day, the High Priest confessed the intentional sins of the Israelites to God placing them figuratively on the head of the other goat, the Azazel scapegoat, who would symbolically "take them away." In Christianity, this process prefigures the sacrifice of Christ on the cross through which God has been propitiated and sins can be expiated. Jesus Christ is seen to have fulfilled all of the biblical "types"—the High Priest who officiates at the ceremony, the Lord's goat that deals with the pollution of sin and the scapegoat that removes the "burden of sin." Christians believe that sinners who own their guilt and confess their sins, exercising faith and trust in the person and sacrifice of Jesus, are forgiven of their sins. Ancient Greeks practiced scapegoating rituals in exceptional times based on the belief that the repudiation of one or two individuals would save the whole community. Scapegoating was practiced with different rituals across ancient Greece for different reasons but was mainly used during extraordinary circumstances such as famine, drought, or plague. The scapegoat would usually be an individual of lower society such as a criminal, slave, or poor person and was referred to as the pharmakos, katharma or peripsima. There is a dichotomy, however, in the individuals used as scapegoats in mythical tales and the ones used in the actual rituals. In mythical tales, it was stressed that someone of high importance had to be sacrificed if the whole society were to benefit from the aversion of catastrophe (usually a king or the king's children). However, since no king or person of importance would be willing to sacrifice himself or his children, the scapegoat in actual rituals would be someone of lower society who would be given value through special treatment such as fine clothes and dining before the sacrificial ceremony. Sacrificial ceremonies varied across Greece depending on the festival and type of catastrophe. In Abdera, for example, a poor man was feasted and led around the walls of the city once before being chased out with stones. In Massilia, a poor man was feasted for a year and then cast out of the city in order to stop a plague. The scholia refer to the pharmakos being killed, but many scholars reject this and argue that the earliest evidence (the fragments of the iambic satirist Hipponax) show the pharmakos being only stoned, beaten, and driven from the community. ^ Gesenius "I have no doubt that it should be rendered 'averter'"
^ Wright, David P. "Azazel." Pages 1:536-37 in Anchor Bible Dictionary. Edited by David Noel Freedman et al. New York: Doubleday, 1992. ^ The Symbolism of the Azazel Goat Ralph D. Levy 1998 "This is still fairly straightforward, and is translated by the majority of the versions as "for Azazel" (Targums Onkelos and Pseudo-Jonathan follow this understanding, as do the RSV, NRSV, REB, and Tanakh). KJV and NKJV have "to be the scapegoat"
^ The Merriam-Webster New Book of Word Histories. Merriam-Webster. 1991. pp. 411–412. ISBN 978-0-87779-603-9. ^ "AZAZEL". JewishEncyclopedia.com. Retrieved 2013-07-04. ^ The JPS guide to Jewish traditions - Page 224 Ronald L. Eisenberg, Jewish Publication Society - 2004 "(Leviticus 16:8–10). In talmudic times, a popular rabbinic interpretation was that Azazel referred to the place to which the goat was sent, the eretz g'zera (inaccessible region) of Leviticus (16:22). Later, Azazel became associated with another..."
^ Zatelli, Ida (April 1998). "The Origin of the Biblical Scapegoat Ritual: The Evidence of Two Eblaite Text". Vetus Testamentum. 48 (2): 254–263. doi:10.1163/1568533982721604. ^ David P. Wright, The Disposal of the Impurity: Elimination Rites in the Bible and in Hittite and Mesopotamian Literature (Atlanta: Scholars Press) 1987:15-74. ^ a b c d e f g Bremmer, Jan (1983). "Scapegoat Rituals in Ancient Greece". Harvard Studies in Classical Philology. 87: 299–320. doi:10.2307/311262. JSTOR 311262. ^ a b c d Westbrook, Raymond. "Who Led the Scapegoat in Leviticus 16:21?". Journal of Biblical Literature. 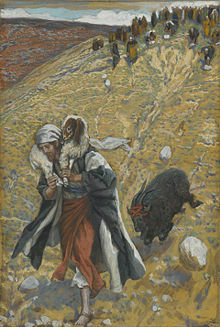 Wikimedia Commons has media related to Scapegoats.